During the Cold War, the US and USSR used Syria as a pawn with scant regard to its legitimate rights. Israel’s decision in the 1970s under Likud leadership to limit territorial concessions to the return of the Sinai meant that Syria had to be isolated and weakened. Israel’s gamble was that Syria, without Egyptian backing, could be made to give up its demand for the full return of the Golan Heights. Syria looks at its diplomatic options and strategic situation somewhat differently than do Israeli or American statesmen. Although it appears from the rhetoric of Israeli and American right wing ideologues that Syria is an evil state determined to spoil all peaceful efforts while sponsoring terror, the reality is that Syria wants a peaceful and secular Middle East where International law is respected by all. While the American and Israeli critics of Syria speak of extending democracy and capitalism, Syrians also speak of their security, recognition, and the full return of their illegally-occupied land. It is time to carefully examine the manufactured negative image of Syria and to bring forward the case for Syria. How does Syria see the world around her? How does Syria see its history and what lessons can be learned from the futility of the repetitive cycles of different actions and strategies since the sixties? The following is an overview of relevant events from a Syrian perspective with a particular emphasis on two competing visions for the Middle East: the one Syria and Turkey aspire to, and the one right wing ideologues in Israel and the United States passionately promote. * Israeli Prime Minister Levi Eshkol’s conversation with his wife after his forces took control of the Golan Heights in June 1967. Initially, many Israeli leaders and army officers did not think that Israel should invade the Golan Heights. But after the quick collapse of the Egyptian and Jordanian armies, and after it was clear that the Soviet Union was not really ready to protect Syria as initially claimed, some senior Israeli officers insisted that they must be allowed to conquer the Golan Heights. Mr. Dayan eventually gave them few more hours to finish the job, before he ended the 1967 war. 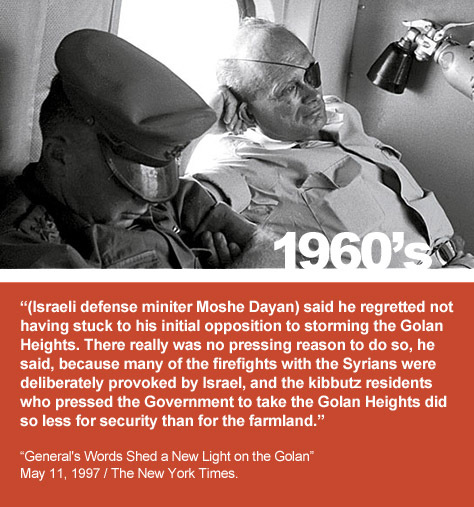 In 1997 the New York Times revealed that late Israeli defense minister Moshe Dayan admitted, 21 years earlier, that the Golan was seized from Syria because Israeli farmers wanted those lands. The frequently cited Israeli security concern that obliged them to seize the Golan Heights, Syrian shelling of Israeli settlers, was not much more than an excuse to justify Israel’s capture that attractive piece of land. Israel’s easy victory over its Arab neighbors had a lasting impact on the way many Israelis formed their attitudes towards the Arab Israeli conflict and the optimal way it should be settled, or even the need to settle it. Israeli hawks concluded that preemption works best, and it reinforced their conviction that Arabs only understand force. They also realized that the United States will provide Israel with necessary cover when needed. The IDF became the pride of every Israeli citizen. The difficult experience of the 1973 war led a majority of Israelis to be interested again in exploring different options for settling their conflict with the Arabs. Syrian President Hafez Assad was firm in his belief that only a comprehensive solution that is based on UN resolutions 242 and 338 will work. He made it clear that he would offer Israel peace and recognition in exchange for withdrawal from all the Arab territories that Israel conquered and continued to occupy since the 1967 war. President Nixon was the first American President to visit Syria since its independence. He later described Hafez Assad in his memoirs as a “tough negotiator but he has a great deal of mystique, tremendous stamina, and a lot of charm. All-in-all he is a man of substance, and at his age, he will be a leader to be reckoned with in this part of the world… This man really has elements of genius – without any question”. Unfortunately for Syria, American officials such as former secretary of state Henry Kissinger, who by 1975 had spent a total of 130 difficult hours negotiating with Hafez Al-Assad, realized that Egypt’s Anwar Sadat would be better suited to potential talks with Israel’s new hard line Likud leadership. With the arrival of Likud to power in May 1977, Israel was not in the mood to offer territorial concessions to the Arabs. Likud’s leaders had their own way of reading Henri Kissinger’s “no war without Egypt and no peace without Syria”. Instead of believing in comprehensive peace that required negotiating with the Egyptians and the Syrians, Israeli leaders at the time decided in effect that their optimal option would be to reach a state of “no war” with their Arab neighbors without the need for full peace. That way, all they had to do was to take Egypt out of the Arab camp. Egypt’s price was manageable. By giving Sadat back his occupied Sinai, Israel got to survive in a state of no-war without having to give back the Golan Heights and the Palestinian territories. The incremental benefits of going from a state of no war to a state of peace were not worth the known price of comprehensive peace. It was during the seventies that one started to hear Israelis explain why they could not have peace with Syria … “Syria’s price is too high”. Syria wanted its Golan Heights back and wanted Israel to settle with the Palestinians at the same time. Nothing more than what UN resolutions 242 an 338 call for. Israel and its friends in the United States, often relying on America’s allies in the Arab world, created countless difficulties and obstacles for Syria in order to keep the country too busy and too weak to challenge Israel one day. The Lebanese Civil war kept the Syrian army busy for decades. The war started in 1975 when Lebanon’s Christians, unhappy with the way the PLO was abusing Lebanon’s hospitality, welcomed Israel’s offer to arm them and train them on the condition that the Christians would fight Israel’s enemy in Lebanon the PLO. Lebanese Muslim and Druze forces joined PLO fighters in fighting the Christian forces. In 1976, Syria decided that it has no choice but to send its army into Lebanon. First, the civil war in Lebanon had to be stopped. Religious inspired violence in Lebanon could easily spill inside Syria’s borders and from there to the rest of the Middle East. Second, the PLO had to be confronted. Their fighters were behaving in a dangerous manner that was quite similar to the way they behaved in Jordan in 1969. Again, Syria felt that they could eventually do the same inside Syria. Third, if Syria did not step in to protect the Christians of Lebanon, Israel would have taken advantage of the situation by continuing to arm, cooperate, and coordinate with the Christians. This high-risk arrangement would have turned Lebanon’s Christian regions into Israeli protectorates. Towards the end of the seventies, Lebanon’s Christians moved again to Israel’s camp and the civil war continued to keep Syria’s army busy for at least another decade before the Taef agreement signaled the end of the bloody civil war in Lebanon. In 1979 a well funded and well armed group of Syrian religious fundamentalists by the name of the Muslim Brotherhood launched a three year long campaign of violence that attempted to overthrow Hafez Al-Assad. The brotherhood was backed by a number of America’s Arab friends who were unhappy with Syria’s army in Lebanon taking the side of the Christians against the Palestinian Lebanese-Muslim alliance. Some of them, such as Iraq’s ambitious new President, Saddam Hussein, were also not happy with the prominent role Syria was playing in the region, and Jordan’s King Hussein was known for his general agreement with American strategies for the region. His kingdom played a direct role supporting Syrian Islamic fundamentalists trying to destabilize and overthrow the regime of Hafez Al-Assad by force. When President Assad led the Arab world to boycotting Egypt, after it signed a separate peace agreement with Israel in 1978, President Carter’s administration expressed its disappointment by placing Syria on the State Department’s new list of states supporting terrorism. That entry was never removed and it continues to complicate Syria’s efforts to improve its economy and to receive international loans and grants. George Shultz boycotted Hafez Assad for five years (1983 to 1988). Assad successfully acted as a spoiler when George Shultz tried in 1983 to take advantage of the special conditions that existed in Lebanon under Israeli occupation to encourage the Lebanese to sign a hurriedly drafted peace treaty with their Israeli occupiers. An agreement that made it almost certain that Lebanon would move away from Syria’s sphere of influence to Israel’s orbit. 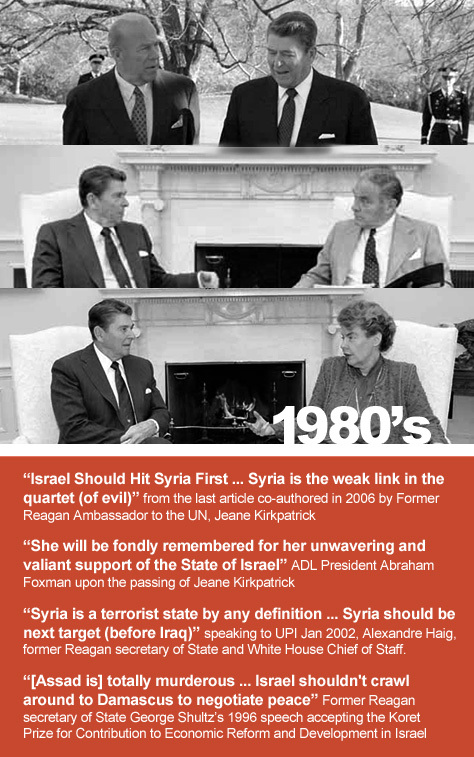 President Reagan’s success in waiting until the collapse of the Soviet Union gave American neoconservatives and Israeli hawks an example that they continue to follow until today. The American British alliance of conservative leaders did not hesitate to send its troops to fight in the Middle East and around the globe. Preemption was considered wise and talking to your enemy was foolish. Although “Dual containment”, an official United States foreign policy aimed at containing Iraq and Iran, two of Israel’s most formidable adversaries, was first announced in 1994, by Martin Indyk (NSC), The 1980-1988 Iran Iraq war was the first real application of the dual containment policy. Millions died or got injured as a result of that war. The United States sold weapons to both Iran and Iraq during that war but clearly favored Saddam Hussein’s Iraq. President George W. Bush based his Middle East foreign policy largely on that of his conservative idol Ronald Reagan. His administration tried to use its eight years in office to finish the job that President Reagan’s administration could not finish in the Middle East from 1980 to 1988. The 90’s a decade of peace negotiations and relative stability in the Middle East. Netanyahu could not sell Clinton his new “Clean break” strategy. Following Saddam’s invasion of Kuwait, President Bush Sr. and secretary of State James Baker decided that before they can build a coalition to fight Saddam they needed the blessing of Syria’s Hafez Assad, champion of Arab Nationalism. Assad joined the coalition after he secured promises from the Americans that they will not occupy Iraq and will start working with Syria towards a goal of comprehensive peace in the region. The Madrid conference was the format Syria proposed to the Bush administration for peace negotiations. Israeli Prime Minister at the time, Yitzhak Shamir, tried to boycott the conference but eventually had to attend in order to avoid escalating his conflict with the American administration. At the peace conference Prime Minister Shamir launched a fierce verbal attack on Syria. Syria’s foreign minister, Farouk Sharaa reciprocated by wanted poster of a young Yitzhak Shamir when he was wanted for his leadership of a terror group in the 1940’s. By personally attending the conference, Mr. Shamir ensured that it failed. He survived the Bush-Baker administration without being obliged to offer the Arabs any territorial concessions in exchange for peace. In June 1992 Yitzhak Rabin was elected to replace Yitzhak Shamir as new Prime Minister of Israel. Mr. Rabin and President Clinton continued to be interested in negotiating with Syria and succeeded in reaching a final agreement before Prime minister Rabin was assassinated by an Israeli extremist in November 1995. After Rabin’s successor, Shimon Peres failed to convince the Israeli people that he has what it takes to protect Israel’s security, Likud, led by Benjamin Netanyahu, returned to power in 1996. Prime minister Netanyahu visited the author of Clean Break, American Neocon Richard Pearle and few days later he delivered a powerful speech at a joint session of the US congress that was largely based on the recommendations outlined in Clean Break. Mr. Netanyahu’s speech was an attempt to rally the troops in Washington DC behind his approach to settling the Middle East conflict. Until this democratization becomes a mainstay of the region, the proper course for the democratic world, led by the United States, is to strengthen the only democracy in the Middle East, Israel … we must make the pursuit of human rights and democracy a cornerstone of our quest. Deterrence must now be reinforced with prevention — immediate and effective prevention. There will never be such a re-division of Jerusalem. Never. The third pillar of lasting peace is democracy and human rights. 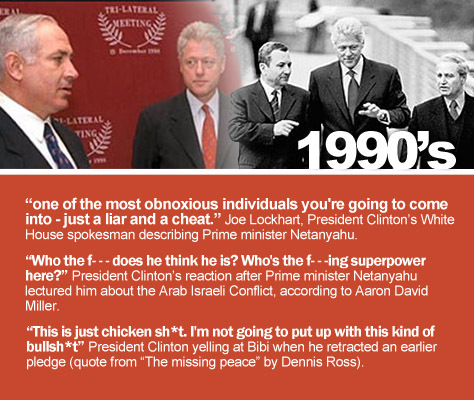 But President Clinton, who despite having special affinity towards Israel (source: Aaron David Miller) had an extremely negative opinion of Mr. Netanyahu. It was impossible for Mr. Netanyahu to motivate President Clinton to believe in his ambitious Clean Break vision. Mr. Netanyahu had to wait until the next American administration arrives hoping that Likud’s friends can make it to powerful positions in that administration and that another President, Like Ronald Reagan, who did not hesitate to use America’s power to confront its enemies would be in charge. Ehud Barak, a realist, was elected in 1999. A few months later he took part in peace negotiations with Syria that were mediated by President Bill Clinton. Syria insisted that Israel should withdraw to the 1967 line, Prime minister Barak worried that he won’t be able to sell his people an agreement that included total withdrawal from the Golan Heights and President Assad reiterated his position that Syria will not accept to compromise its lands. Negotiations stopped and Mr. Barak decided that before he sits down again to negotiate peace with the Syrians, he needed to weaken their hand by taking the Hezbollah/Lebanon card away from them. Ehud Barak decided to unilaterally withdraw the Israeli army from Lebanon hoping that by doing so, Hezbollah won’t be relevant anymore. Hafez Assad Passed away June 2000. 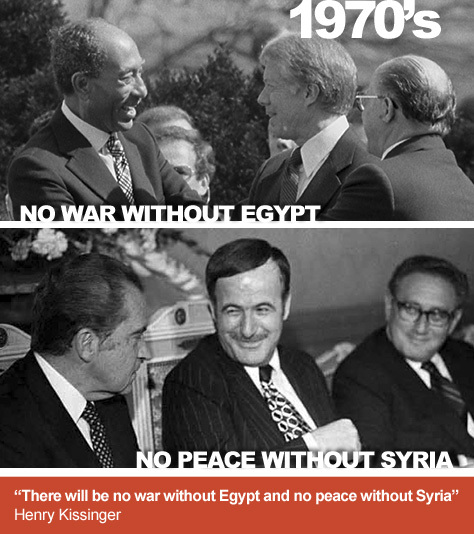 There was hope in the United States, Europe and in Israel that his son and successor will be a Sadat, not an Assad. Everyone was nice to Bashar Al-Assad for two or three years.The Queen of England received him, President Chirac called him every week, moderate Arab leaders offered to help in anything he needs. In Israel, Ariel Sharon replaced Ehud Barak. He made it clear there will be a new approach to dealing with Israel’s Arab neighbors. The attacks of 9/11, GWB’s wish to punish and finish Saddam Hussein, the role of the defense industry’s lobby, and the presence of a number of leading neocons who occupied senior positions in the Bush/Cheney administration helped Likud hawks (Benjamin Netanyahu and Ariel Sharon) to take advantage of the best chance ever to shape Israel’s environment to its liking. Plans were put in effect to destroy Saddam Hussein’s Iraq and to weaken and, if necessary, invade Syria next. Hezbollah and Iran were also on the list. Syria promptly complied with UN resolution 1559 by withdrawing the last 15,000 troops it had in Lebanon (out of 62,000 peak). Israel continued to occupy a small part of South Lebanon and Hezbollah continued to define itself as the defendant of Lebanon against Israeli occupation and aggressions. With the invasion of Iraq In 2003, millions of Iraqis were affected. Hundreds of thousands were killed, millions injured, displaced, terrorized, imprisoned or tortured. In 2005 it seemed that Mr. Netanyahu’s strategy, as outlined in “Clean Break”, was in its final and highly successful stages of application. Baghdad fell to the coalition forces with so much ease that Arab nationalism, as championed by Saddam Hussein and Syria was being perceived by the Arab masses as a huge failure. Syria, the only Arab state that continued to resist American and Israeli right wing ideologues’s aggressive plans for the region was at the receiving end of words of wisdom expressed in endless “moderate Arab” newspapers’ editorials and opinion pieces that called on the “foolish” and “inexperienced” “Baathist” leaders in Damascus to give up everything and save Damascus from imminent and inescapable Baghdad-style destruction at the hands of American forces who would be heading to Damascus as soon as they are done with Iraq. The Palestinians were demoralized, Prime minister Sharon was described as a man of peace by President Bush at the time Israeli forces were pounding Palestinian cities in the west bank. November 2005. President Assad delivered a speech at Damascus University in which he made it clear that his country will not give up. It was time for more pressure on Syria. Destroying Hezbollah seemed like a logical next step and just like the sequence of events during the Reagan administration, Israel invaded Lebanon severely damaging the country’s civil infrastructure and killing 1183 Lebanese people (UN children’s fund figures). To everyone’s surprise, Hezbollah’s five thousand fighters performed very well against the much larger and better equipped Israeli army. Hezbollah emerged much stronger after it managed to keep at bay Israel’s powerful army. At that time, it was reported that French President Jacque Chirac asked Israel to attack Syria and topple President Assad. Israeli, French, and American frustration aside, it was clearly the beginning of Syria’s rise to prominence in the Middle East. The Arab world believed in resistance again. “Hassan” (Nasrallah) became one of the most popular names that parents gave to their male newborns in much of the Arab world. Next, it was time to try burning Syria’s other “card”, democratically elected Palestinian representatives in Hamas. Near the end of the Bush administration, Israel got the green light to attack Hamas in Gaza. Over a thousand Palestinian people were killed and Gaza was destroyed (est 1314). Syria and Turkey lost faith in Israeli politicians’ claims that they were genuine in their interest in peace. The timing of the very optional Gaza attack was not easy to justify. During and after the bloodshed in Gaza, public pressure mounted for America’s main Arab ally, Saudi Arabia. The rich kingdom finally decided to give up on the Bush administration’s five year campaign to isolate Syria. The Saudis recognized Syria’s leading role in Lebanon and in the Arab world in general. Most of their Lebanese allies followed. 2010: … or is it 1938? Mr. Netanyahu’s prime decade has just ended. By 2005 it seemed that almost everything was going according to his battle plan. But things changed. The turning point was President Assad’s defiant speech at Damascus University in November 2005. Another turning point was Israel’s failure to achieve its objectives during its 2006 invasion of Lebanon. By the end of the decade, there was radical change. In the long run, there are two main strategists with lasting power in the Middle East, Israeli/American right wing ideologues, and Syria. Their visions for the Middle East are in most ways diametrically opposed. When one side is winning, the other is usually in retreat. So where do they stand today? The BBC conducts world-wide opinion polls that attempt to measure positive and negative impressions for a large number of countries. Between 2007 and 2009, Israel hovered around the lowest spot. 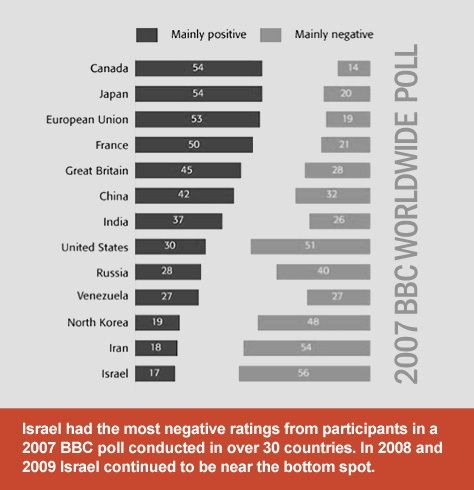 Israel’s competitors for the highest percentage of negative opinions were Iran, North Korea and the United States under the Bush/Cheney leadership. Israel continues to enjoy nearly unanimous support on Capitol Hill. While most issues debated in congress receive votes that are split 48-52% at most, any vote that seems to interest Israel one way or the other tends to unite America’s elected representatives who always manage to vote Israel’s way with over 90%. On the other hand, the Obama administration is mostly made of realists who prefer prudence over preemption. It is clearly not a natural or automatic partner for Mr. Netanyahu’s “This is 1938 and Iran is Germany” war project, although there is little doubt the administration will continue to show more sensitivity and understanding to Israel’ needs and desires than it will for the Arabs. 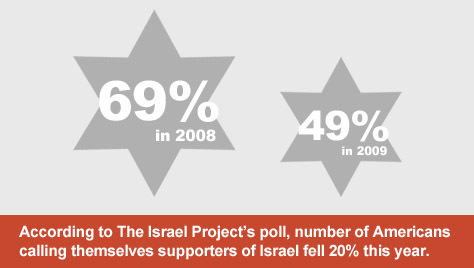 Finally, a poll conducted by the Israel Project, revealed that support for Israel in the United States suffered a 20 point drop in 2009. Support for Israel among Christian Zionists and some evangelical Christians remains strong. Israeli ambassadors and prominent allies of Israel from Capitol Hill often put in an appearance at Christian Zionist rallies to motivate them and to encourage them to lobby for Israel more actively in Washington. In recent years, Syria’s image in Lebanon suffered heavily from constantly reinforced accusations that it was behind the assassination of Rafiq Hariri in addition to American and Saudi claims that Syria is interfering in Lebanese politics. As it became clear that there is no evidence to link Syria with the Hariri murder, and as Syria demonstrated its ability to help the Lebanese settle their differences peacefully (Qatar agreement) support for Syria in Lebanon skyrocketed. A poll conducted between 11-15 August 2009 reveals that Syria’s support in Lebanon is up by close to 25% (from 47.5% in 2008 to 72.3% in 2009). 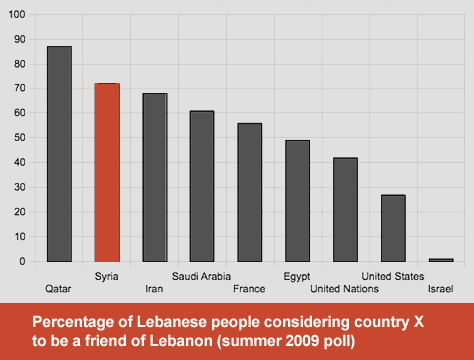 Syria’s close political ally, Qatar was the most popular country in Lebanon (86.6%), followed by Syria. A number of polls suggest that in 2009, President Assad appears to be the most popular leader in the Arab world. A University of Maryland/Zoghby International poll conducted in a number of moderate Arab countries showed that Assad was the most admired foreign leader. A CNN (Arabic) online poll asked the site’s readers to vote for the “2009 international person of the year” award. President Assad won by a landslide, receiving the votes of 67% of the 30,679 Arabs who voted. Syria’s closest ally Turkish Prime minister Recep Erdogan got 28% of the votes. The above polls demonstrate that Syria and its allies (Turkey, Qatar, Iran, and Hezbollah) are the choices of an overwhelming majority of the Arab people. In 2005 Israel had the respect of many Arab leaders who agreed to secretly cooperate with the Jewish state against their common adversaries: Syria, Hezbollah, Hamas and Iran. By 2010, very few Arab officials wanted anything to do with Israel. Egypt and Jordan remain to two exceptions, but only at the official level. Egyptian leader Hosni Mubarak is growing increasingly unpopular every time he cooperates with Israel against Hamas. The Saudis made it clear to the Obama administration that they will not normalize with Israel ahead of a final settlement between Israel and its Arab neighbors. Prince Bandar who Aluf Benn claimed was the man “behind the quiet slide [Saudi Arabia] is making towards Israel”, totally disappeared from public life in Saudi Arabia. His fall from grace is perhaps the most vivid example of the collapse of efforts to normalize Israel’s relations with the Arab world based on peace for peace, with no prior land concessions on Israel’s part. Saudi Arabia realized that Syria’s camp is the wiser choice. 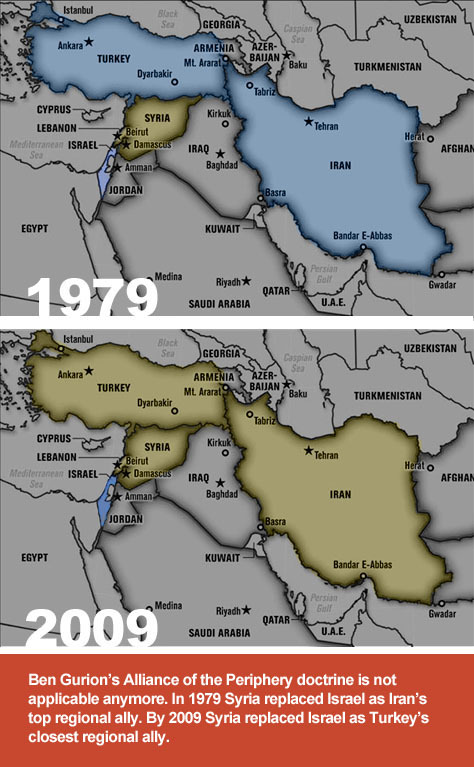 By 2009 and specifically after Israel terminated Turkish mediated peace talks between Syria and Israel through its surprise war on Gaza, Syria completed a process it started in 1979… to gain the friendship of the two large and important Islamic countries that lie on the periphery of the Middle East, Iran and Turkey. Both countries used to be among Israel’s strongest allies. Today, over 600,000 Iranian tourists visit Syria every year. Borders with Turkey are open to people from the two countries to Travel and trade as if they are in their own country. Ben Gurion’s “Alliance of the Periphery” doctrine is not sustainable for Israel anymore. Israel continues to enjoy special relations with owners, managers, and editors of media outlets. However, a number of highly unpopular actions (invasions of Lebanon and Gaza, failure to stop the expansion of Israeli settlements) and a number of controversial Israeli statements (see “voices from Israel”) are generating increasingly negative coverage for Israel. Yet in 2008, the same Ehud Barak led his troops into Gaza, killing in the process over a thousand Palestinians, and as he predicted in 1987, it did get worse and he was branded a war criminal. The rise of the popularity of online news and other online sources of information contributed to a gradual erosion of Israel’s traditional effectiveness in ensuring press coverage in traditional media outlets that was generally seen as being to its advantage. You Tube is full of clips showing Israeli bombardment of civilians in Gaza. Unflattering news reports and opinion pieces are promptly and widely forwarded or posted on FaceBook profiles. Israel believes it can undo the damage by recruiting an army of bloggers to combat unfriendly websites. 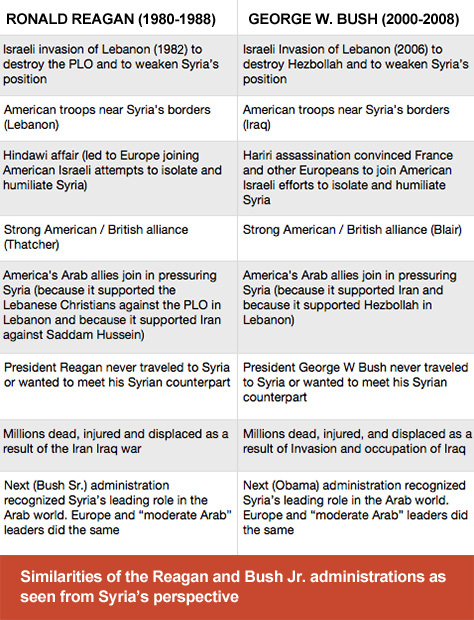 Syria coverage, exceptionally negative during the Bush administration, morphed into a completely different tone. 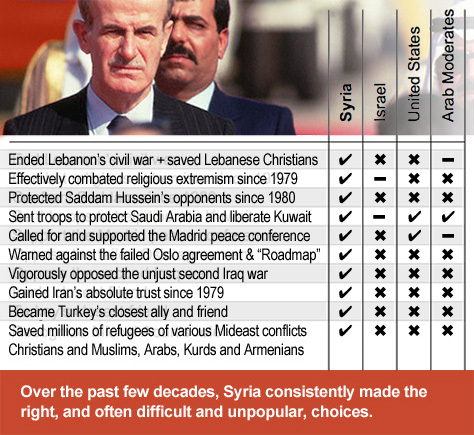 Syria’s decision making over the past four decades was mostly on the mark. 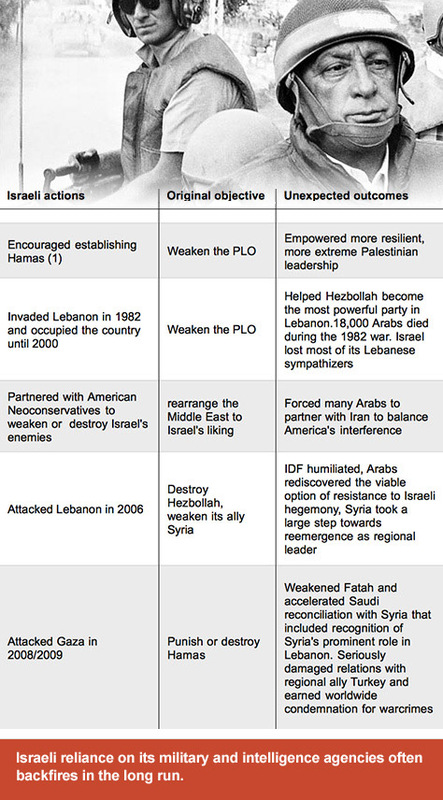 The table below shows that no other player in the Middle East can claim the same. When everyone was betting on Saddam Hussein, Syria bet against him and warned that he is a dangerous man. His Sunni, Shia and kurdish opponents lived safely in Damascus. among those were Iraq’s current President and current Prime Minister as well as former Iraqi Prime Ministers. When everyone was involved in arming Afghani Mujahidin to fight the Soviet army in Afghanistan and when they were ignoring the rise of Saudi wahabi financed Arab Islamic fundamentalists, Syria was fighting those same religious extremists. Syria predicted that the Oslo agreements will be a failure, that the same fate awaited “the road map”, that Egypt’s Camp David Accord will not bring peace to the Middle East, that Ariel Sharon’s unilateral withdrawal from Gaza was not a step towards peace, that George Shultz’ May 17 “peace” (surrender) agreement he proposed for Lebanon was dangerous, that the second Iraq war will be a quagmire for the United States and a disaster for Iraq and the Middle East. Being described as hysterical, obstructionist, or a supporter of terror are a few examples of the price Syria had to pay each time it warned against what it strongly believed was a mistake, at times when The United States, Israel and “moderate Arab” countries (US allies) held different views. Syria made one serious strategic mistake. It waited too long before withdrawing its army from Lebanon and its representatives in Lebanon played a role that was beyond their security role. But when a very large number of Lebanese were planning to demonstrate against Syria in downtown Beirut, Syria’s army did not close the area and did not prevent them from demonstrating. When UN resolution 1559 asked Syria to withdraw its forces from Lebanon, Syria promptly complied even though Syria was not specifically named in that resolution that only called for the withdrawal of all “foreign armies” from Lebanon. Israel, on the other hand, proved to be mostly unwilling to learn from past mistakes. Israeli leaders continue to find it difficult to resist sending their army to deliver non-proportional punishment to their Arab neighbors. They still encourage any like-minded American administration to help them rearrange the Middle East, and they still do not want to respect international law. A good example is Israel’s invasion of Lebanon in 1982 which was initially justified by the need to push the PLO 45 kilometers north of Israel’s borders to prevent them from attacking Israel. Instead, Ariel Sharon motivated his Prime Minister, Menachem Begin, to approve a much more ambitious operation that would send Israeli troops to Beirut and to Syria’s border. Eighteen years later (and 18,000 Lebanese and Syrian casualties later), when Prime minister Ehud Barak withdrew Israeli troops from the south of Lebanon in 2000 Syria was able to claim victory over Israel and a new enemy of Israel was created. Hezbollah (and Lebanon’s Shia population) … a considerably more effective enemy than the PLO in resisting Israel’s occupation. Israeli hawks sometimes give the impression that they do not think the laws of nature apply to their country. 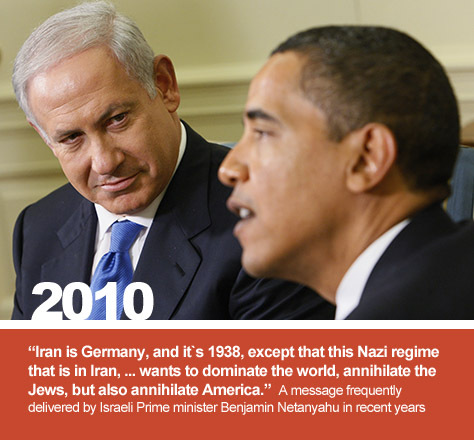 Every action has an equal and opposite reaction, … it might be the case that routinely threatening Iran with crippling international sanctions and possible preemptive wars (starting in 1996) might have been one of the reasons Iran today adopted a similarly hostile language towards Israel. Energy can not be destroyed, it can only be transformed from one state to another. Israeli occupation of other people’s land by force led to anger and or determination to resist the occupation. Israel did not destroy this energy when it pounded Beirut in 1982 until it sent the PLO away to Tunisia. That energy was acquired by Hezbollah. When right wing ideologues destroyed Iraq, that energy was not destroyed, it was acquired by Iraq’s neighbor Iran. At the risk of sounding simplistic, the only way Israel can have real peace and security would be for Israel to undo the reasons that led to resistance. Looking back at the legacy of the various combinations of American/Israeli administrations, it is clear that there was rarely any positive achievement. Saddam Hussein was kicked out of Kuwait in 1991, then he was removed from power in 2003, Egypt signed a peace treaty with Israel but its people today generally have highly negative opinions of Israel. Jordan also signed a peace treaty with Israel, although it was not much more than a formality given the prevailing excellent ties between Israel and the Hashemite King of Jordan. The list of negative outcomes is much longer. And most of them come from the times when both Israel and the United States were governed by right wing ideologues, eight years of the Reagan administration (Begin and Shamir in Israel) and eight years of the George W. Bush administration (Sharon and Olmert in Israel). The legacy of the “dual containment” policy is that over a million Iraqis and Iranians died during the 1980-1988 war between the two countries. The legacy of the Bush/Cheney/Netanyahu “shaping of Israel’s environment” Clean Break strategy is that millions of Iraqis were killed, injured, or turned into refugees. It might be true that as a result of the Iraq invasion Israel’s enemy Iraq was weakened, but it is also true that Israel’s much more serious enemy, Iran, was empowered and was able to extend its influence into Iraq as well as next to Israel’s borders in Lebanon and in Gaza. It is also useful to illustrate the similarities of the strategies, tactics and legacies of the two eight-year periods when right wing ideologues where in power in both Israel and the United States, as outlined in the table below. 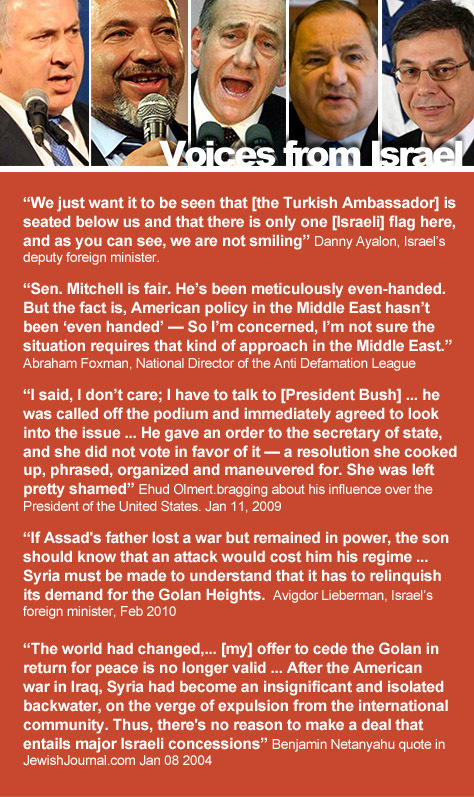 Another similarity: Three years into their term in office, the Secretary of State (George Shultz in 1983, and Colin Powell in 2003) was sent to Damascus with a serious and long list of American/Israeli demands. Both secretaries explained to their Syrian hosts that the American administration had enough talking and now wants results …. capitulation, in other words. Hafez and Bashar Al-Assad explained that Syria does not accept dictation, and does not sacrifice its national rights no matter how much pressure Washington and Tel Aviv managed to apply. For the next five years (1983-1988, 2003-2008) American secretary of States boycotted Damascus and communication lines between Damascus and Washington DC ceased to exist . Given the central role that both Syria and the United States play in the Middle East, the decision to boycott Syria had many negative consequences. It is important to realize that decisions to boycott Syria emerge as a result of not only ideological convictions, but also due to personal animosities held by ideologues in Washington towards Syria’s leaders who are not good in taking orders from ideologues who do not understand the Middle East too well. Mahatma Gandhi’s original calls on occupiers to accept the futility of fighting to maintain control over lands occupied by force … a clean break with their occupied lands, a clean break with all the time, energy, and high hopes associated with their long battle to retain those territories forever. Mr. Netanyahu’s version calls for using force to secure the realm, or to favorably shape the occupier’s environment by assembling more potent coalitions in order to discredit, weaken, destroy and break the will of all those who might resist the occupier’s wish to maintain control over his occupied lands forever. Israel and its friends and allies in the United States need to make a clear and decisive choice. A choice between the two diametrically different versions of clean break. If Mr. Netanyahu continues to believe in his own doctrine, then we can already predict a bleak future for the region. If Israel’s leadership is ready for a lasting paradigm shift, if it is ready to abandon its quest to reshape Israel’s strategic environment by force, it might find Syria ready to articulate a vision for the Middle East where an Israel that is willing to act like an ordinary state, despite its many impressive achievements, can play one of the leading roles in the development of a new harmonious, prosperous and highly connected Middle East. One hopes that fifteen eventful years after late Prime Minister Rabin’s transformation into a genuine peace maker earned him the respect and trust of his enemies, Mr. Netanyahu is finally ready for a serious and constructive dialogue with his neighbors about a common vision for the future of the wider Middle East and not about the parts of their occupied lands that Israel refuses to give back.